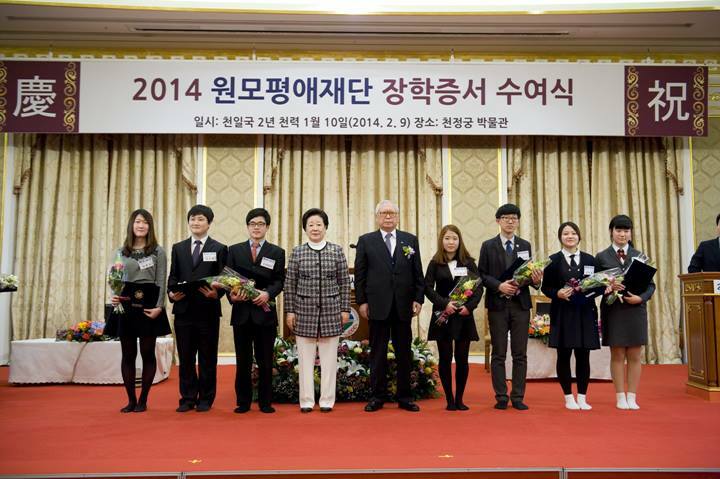 Dr. Hak Ja Han Moon: The Wonmo Pyeongae Foundation presided over the 2nd Scholarship Certificate Presentation Ceremony and Service Work Award Ceremony. Ten billion won in scholarships was presented to 1,455 talented individuals in honor of the future realization of Cheon Il Guk. - The Wonmo Pyeongae Foundation presided over the 2nd Scholarship Certificate Presentation Ceremony and Service Work Award Ceremony. At the Foundation’s inauguration ceremony, Dr. Chang Shik Yang, president of FFWPU Korea, offered an opening prayer, and Dr. Bo Hi Pak, president of the Korean Cultural Foundation, gave a report on the Foundation’s proceedings. 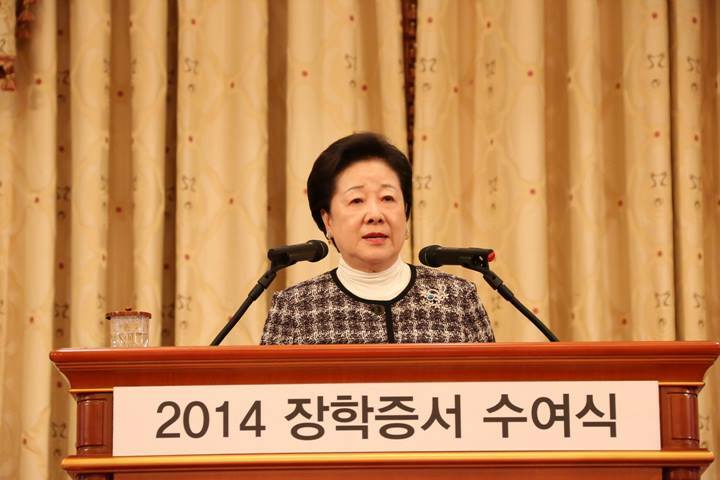 Mrs. Min Ha Kim, CEO of the Wonmo Pyeongae and the former president of Joongang University, said in her welcoming speech, “I will do my best to support the Wonmo Pyeongae Foundation to raise talented people.” Kim also said that the Foundation would promote the “Sunhak Peace” awards, which go to individuals or organizations practicing Rev. 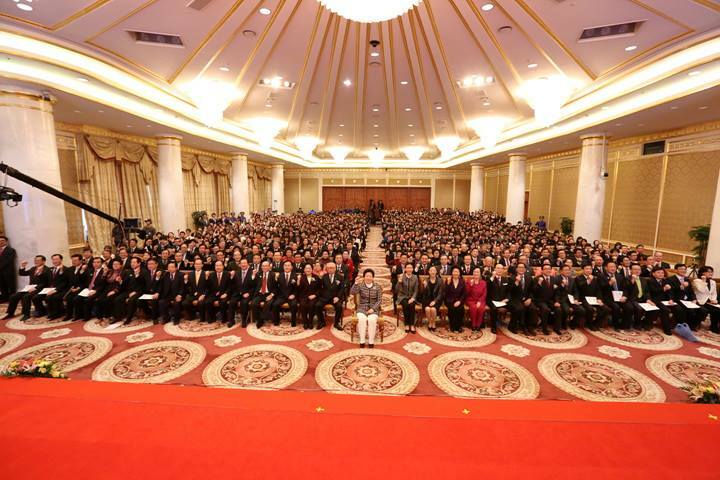 Moon’s vision of peace internationally. According to Wonmo Pyeongae Foundation’s website, www.wonmo.org, Wonmo means “eternal parent” which refers to God, “the Heavenly Parent.” Pyeongae means “equal love” or “peaceful love.” The Foundation’s logo is composed of a green pigeon and a blue heart above an orange laurel wreath. The website explains that the pigeon symbolizes “peace,” the heart symbolizes “true love,” and together their formation embodies the safe arrival of a peaceful world centered on God’s peaceful love, which is eternal love. The green color symbolizes ideal peace, the blue color symbolizes true love and hopeful vision, and the orange color symbolizes future victory and glory. These colors represent Wonmo Pyeongae Foundation’s bright future towards establishing a peaceful word that transcends religions and races. 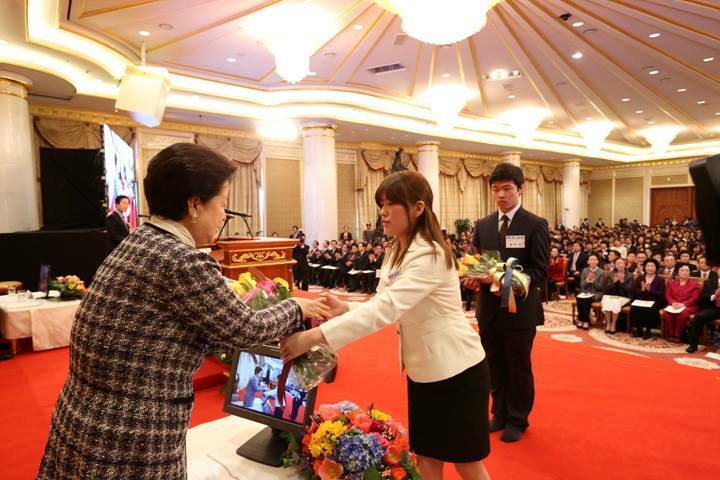 In commemoration of the First Anniversary of Cheon Il Guk, the Wonmo Pyeongae Foundation (President Kim Min Ha) presented 10 billion won in scholarships to 1,455 talented individuals to honor the future realization of Cheon Il Guk. On January 10th at 2:00 PM, by the Heavenly Calendar (February 9th), 300 Korean and 50 international scholarship student representatives attended the 2nd Scholarship Certificate Presentation Ceremony and Service Work Award Ceremony at the Cheon Jeong Gung Museum. 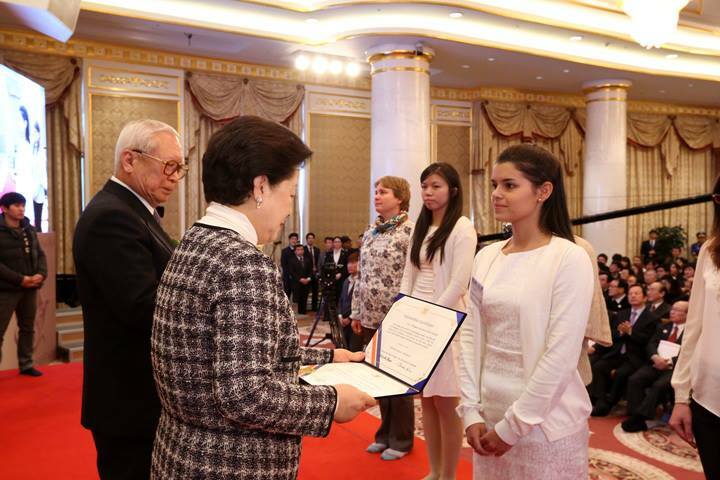 The Wonmo Pyeongae Foundation selected about 1,455 students (400 Korean and 1,055 international students) for the second round of scholarships. The 1,055 foreign students receive academic support through the Foundation’s aid, as well as opportunities to learn Korean culture and grow as talented individuals. Sun Moon University in Asan, Chungnam, will be hosting these talented global students. The Wonmo Pyeongae Foundation also selected about 40 graduate students to receive tuition and living expense coverage, to help them become leaders of the future. The Wonmo Pyeongae Foundation also awarded five individuals and five organizations with the Wonmo Pyeongae Service Work Awards. 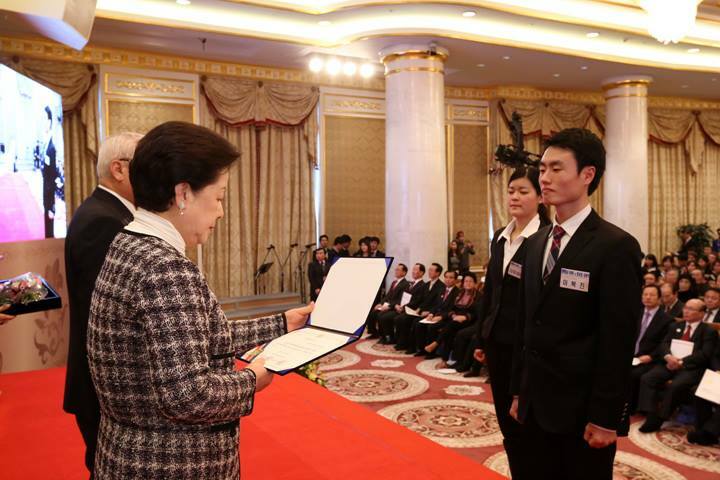 Kim Min Chang, Kim Sang Gyun, Yang Nyeon Ju, Oh Jang Jin and Lee Dong Gyu were designated as awardees for their dedication and service of at least 10 years toward improving their communities. Organizations that were awarded included the Seoul Multicultural Families’ Association, which serves and educates multicultural children, the One Love Women’s Association, a women’s organization devoted to developing communities and the needy through service, The Yeongdeungpo Peace Service Corps, recognized for its continued work in helping the needy and in beautifying the environment, the Chung Bok Multicultural Forum, which aids multicultural families in the community through scholarship and educational support programs for vulnerable social and cultural classes and the One Cherry Association, an organization through which Japanese wives living in Korea have been continuously serving their communities for over 10 years. Chairman Han presented scholarship certificates to representative students Park Hyang Eun (Stanford University), Nagata Remi (Tokyo University), students from Canada, Brazil, The Democratic Republic of Congo and other students from 52 countries. 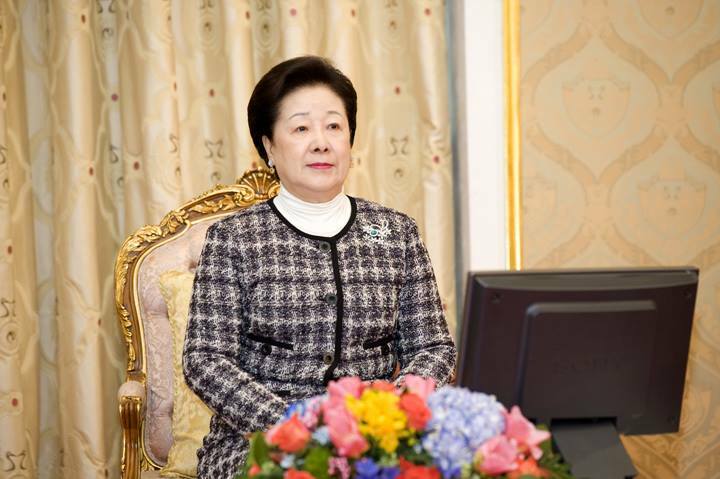 She also directly presented the service awards to the five individuals and five organizations, and encouraged each of them to continue growing and developing. 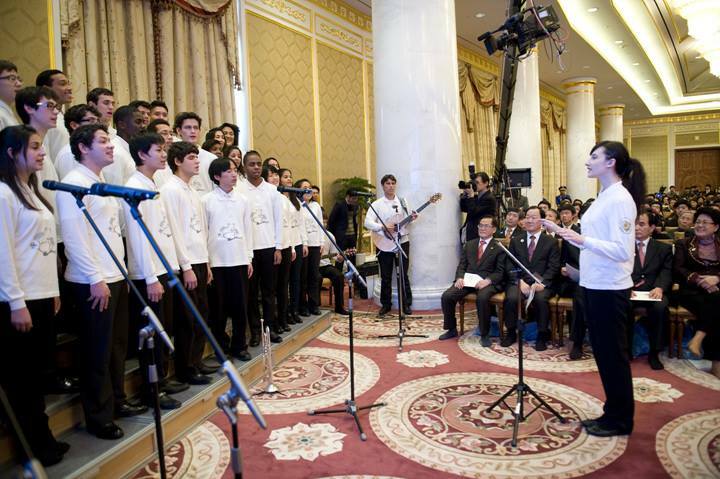 In the middle of the event, a choir composed of 30 of the Wonmo 1st stage scholarship students, and 40 global scholarship students, sang a congratulatory song, and exchange scholarship students who have only been in Korea for 2 months wrote letters of gratitude in Korean and presented them to Dr. Han. 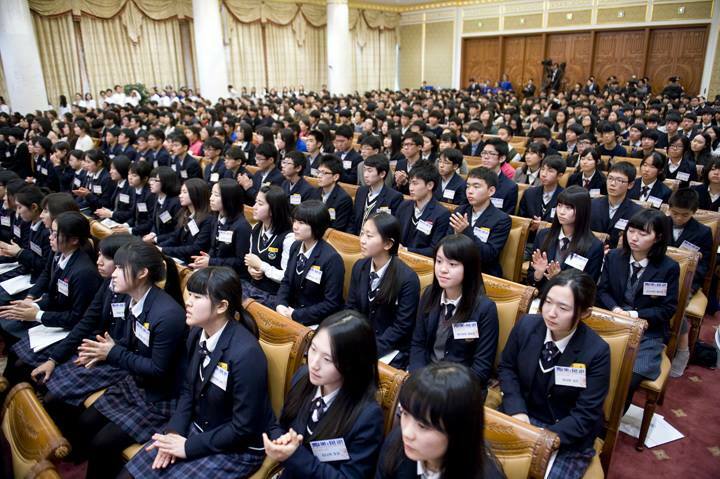 In 2013, the Foundation awarded about 4 billion won in scholarships to about 700 high school and university students from around the world. This year, in the second round of scholarship presentations, the Foundation was able to increase the range of scholarship students to include middle school and graduate students. They were also able to drastically increase the volume of funds given to about 10 billion won.